The patient is a 19-year-old female who presents with a one-week history of headache, one day of left "eye swelling," and pain that is worse with eye movement. Additionally, she notes mild, horizontal binocular diplopia on side gazes and mild blurring of vision in the left eye. The right eye is unaffected. She was initially seen by her primary care provider and was diagnosed with headache due to sinusitis. Her headache persisted for seven more days, and when she developed "swelling" in the left eye, she sought care at a local emergency department. A computed tomography (CT) of the head was done which reportedly showed "an enlarged left medial rectus muscle." She denies any recent trauma. She denies any history of autoimmune disease or thyroid abnormalities. She denies photophobia, fevers, or rash. She reports recent weight gain after cholecystectomy, but no hot/cold intolerance, hair loss, diarrhea, constipation, or heart palpitations. She has menstrual irregularity at baseline. Eyelid/external: Mild eyelid edema, trace erythema, preservation of eyelid crease. CT imaging of the orbits without contrast (Figure 1) shows marked enlargement of the left medial rectus muscle and tendon, with adjacent fat stranding. The sinuses are clear. There is no apparent orbital abscess, thickening of the posterior sclera, or enlargement of the lacrimal gland. Figure 1: CT of the orbits without contrast: The axial image on the left demonstrates enlargement of the left medial rectus muscle, including the tendon (red arrowhead) with adjacent fat stranding (red arrows). The coronal image on the right demonstrates enlargement of the left medial rectus (blue arrow) in comparison to the right medial rectus. Note the absence of sinus disease, retro-orbital mass, or enlargement of the lacrimal gland. The patient was started on 80 mg oral prednisone. Two days later, her symptoms had fully resolved. She was instructed to continue 80 mg prednisone daily for five more days, followed by a taper to 60 mg daily for one week, and then 40 mg daily for one week. Calcium, vitamin D, and a proton pump inhibitor were started to ameliorate side effects related to high-dose steroid use. At her three week follow up visit, she reported that her pain had returned when she tapered to 40 mg prednisone daily. As a result, she independently increased her dose to 60 mg, and her pain quickly resolved. A slower taper was then prescribed: 50 mg for one week, followed by a taper of 10 mg weekly. Additional tests were collected. At her follow up visit six weeks after presentation, she was on 30 mg prednisone daily with adequate control of her ocular symptoms. The slow prednisone taper was continued, decreasing by 5 mg per week. Unfortunately, she was gaining weight, had developed acne, and was found to have a mildly elevated hemoglobin A1c (6.2%). She was referred to rheumatology for evaluation and possible need for a steroid-sparing agent. She was lost to follow up for several months by both rheumatology and ophthalmology. During a follow up telephone call four months after her taper, she reported that she had successfully tapered off of prednisone and remained asymptomatic. In total, she received steroids for approximately 16 weeks, starting at 80 mg daily, with the rate of taper slowed as the dosage decreased. Idiopathic orbital myositis (IOM) is a rare clinical condition characterized by idiopathic inflammation primarily involving the extraocular muscles. It most commonly affects patients in the third decade of life, with a female predilection (1). Patients typically present with moderate to severe eye or orbital pain, decreased extra-ocular motility, diplopia, proptosis, swollen eyelids, and conjunctival hyperemia. Visual acuity is typically spared. The absence of pain does not preclude a diagnosis of IOM, but it certainly raises concern for an infiltrative or neoplastic process, which would require a biopsy. Diagnosis requires the exclusion of other diseases. The differential diagnosis consists of thyroid-associated orbitopathy (TAO), infection (cellulitis, tuberculosis), myositis with associated auto-immune mediated systemic disease, carotid-cavernous fistula, IgG4-related disease, optic neuritis, sarcoidosis, granulomatosis with polyangiitis, Tolosa-Hunt syndrome, and orbital lymphoma (1, 2). Workup should include a full ophthalmic examination with particular attention paid to vital signs, optic nerve function, extraocular motility, exophthalmometry, and eyelid position. It is most important to exclude TAO, as it may appear clinically similar. Initial laboratory workup should include a CBC, ESR, CRP, TSH, free T4, and thyroid stimulating antibody (TSI) (3). TSI is a useful test for diagnosing TAO in euthyroid patients, and has been shown to correlate with disease activity (4). Any additional workup (e.g. IgG4, ANCA, ACE, orbital biopsy) should be guided by the clinical picture, including patient demographics, co-morbidities, review of systems, and preliminary lab results. Imaging may include magnetic resonance imaging (MRI) of the orbits with and without contrast and with fat suppression, as this will best evaluate soft tissue. CT of the orbits is a useful alternative if MRI is not readily available. CT is the modality of choice if there is clinical concern for an abscess or involvement of an orbital bone or adjacent sinus (1). Radiologic features of IOM include unilateral thickening and enhancement of the involved extraocular muscle(s) and myotendinous insertion (1, 2, 5, 6). If available, orbital ultrasound is a quick and cost-effective method of evaluating the extraocular muscles and may be substituted if more advanced imaging is unavailable or contraindicated (1). TAO will have similar enlargement of the extraocular muscles with relative sparing of the tendon (1, 2, 6, 7). High dose non-steroidal anti-inflammatory drugs (NSAIDs) (e.g. ibuprofen 600-800 mg three times daily) are a reasonable first line treatment option in non-diplopic patients with mild to moderate pain or in patients with mild diplopia and pain. Many of these patients achieve control of symptoms, resolution of acute inflammation, and may never require additional treatment (8). However, systemic corticosteroids have been the mainstay of treatment with the goal of hastening recovery and preventing recurrence. The starting dose is typically 1 mg/kg/day with a rapid clinical response supporting the diagnosis of IOM. A gradual steroid taper should follow the clinical response. Unfortunately, up to 80% of IOM patients relapse after (or during) steroid taper, and many investigators believe that this is due to inadequate dosage or duration of corticosteroids (9). At present, there is a paucity of literature on a steroid taper regimen that prevents or reduces recurrence. After failure of a taper, prolonged steroid use, or intolerable steroid-related side effects, providers may resort to a variety of alternative treatment options, including periocular steroids, immunomodulatory therapy, focal radiation, or referral to a pain specialist (1, 9). Despite the variety of treatment options available, specific treatment guidelines for IOM do not exist. This, in combination with a tendency for IOM to recur, often leads patients down a long and convoluted treatment path. Patients may self-taper prednisone, increase their dosage according to symptoms without consulting a provider, or become disillusioned and lost to follow up. For these reasons, retrospective review of IOM patient outcomes, along with quantifying the success of treatment, has been challenging. In order to guide future research and streamline patient care, we will detail the treatment algorithm used at our institution, and others may chose to adopt this practice. The algorithm is based on clinical observation, years of expertise by oculoplastic/orbital surgeons and neuro-ophthalmologists, and a partnership with our colleagues in rheumatology. Our proposed taper regimen is a thoughtful synthesis of recommendations from a consensus panel on immunosuppression for ocular disease and by research on giant cell arteritis (GCA), an inflammatory disease that also tends to relapse during steroid taper (10). A recent, prospective, longitudinal study of 128 GCA patients reported that 44 patients relapsed 59 times, and 56 of the 59 relapses occurred at prednisone doses of 20 mg daily or less (11). Once in this range, relapses occur irrespective of steroid dose, a finding also reported in a prospective cohort study of GCA patients in which steroid taper regimens were controlled (12). 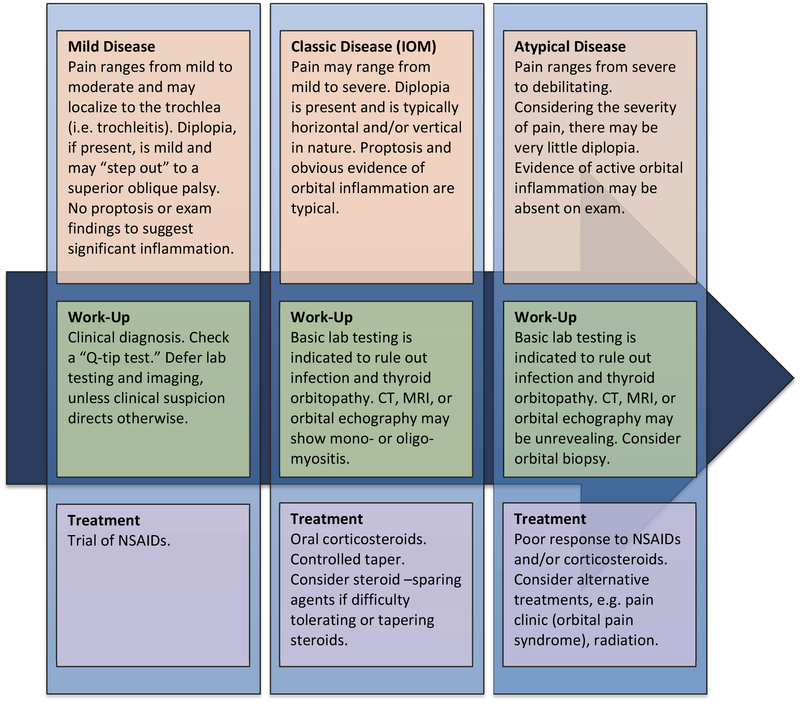 When deciding on the initial clinical approach to the diagnosis and treatment of IOM, it can be helpful to think of IOM as a spectrum of disease. Though the classic presentation is well-defined, IOM can present along a spectrum of severity, often overlapping with or evolving into entities as simple as trochleitis or as complex as ill-defined orbital pain syndromes. The astute clinician will tailor their diagnostic and therapeutic approach based on exactly where an individual patient falls along this spectrum. A mild presentation, likely more akin to trochleitis or superior oblique tendonitis, may be diagnosed clinically and treated conservatively. Patients who present with classic IOM (as described above) may require basic laboratory workup with imaging, along with traditional corticosteroid therapy. Severe or atypical cases warrant an extensive workup with aggressive and/or non-conventional treatment (Figure 2). Figure 2: A framework, or starting point, for the disease spectrum of idiopathic orbital myositis. CBC to evaluate for infection. TSH, free T4, and TSI to screen for thyroid disease (13). Consider a BMP (including glucose) prior to starting NSAIDS. Check AST, ALT, and a purified protein derivative (PPD) test if starting high dose steroids. 2. Q-TIP TEST: A cotton-tipped applicator applied to the area over the trochlea and over other extraocular muscles may reveal point tenderness that the patient was otherwise unable to describe. This suggests trochleitis, superior oblique myositis/tendonitis, or focal myositis over the tender muscle or tendon. 3. RECOMMENDED IMAGING: MRI of the orbits with and without contrast with fat suppression or CT of the orbits if MRI is not readily available, there are contraindications to MRI, or there is clinical concern for possible involvement of orbital bone or adjacent sinuses. 1. TRIAL OF NSAIDs: If pain is mild to moderate, there is no diplopia, and the patient has no contraindications to NSAID use, consider a trial of NSAIDs, e.g., ibuprofen 600 mg – 800 mg three times daily. 2. CORTICOSTEROIDS: If NSAIDs fail or symptom severity precludes conservative treatment, start oral prednisone 1 mg/kg/day (typically 60-80 mg/day in an adult). For very severe cases, intravenous pulse methylprednisolone can be used at 1 g daily for three days. Patients can then be converted to oral dosing at 1 mg/kg/day. Continue this treatment for one week, as symptoms should rapidly resolve. Start 1500 mg calcium and 800 IU vitamin D daily. For perimenopausal/postmenopausal women and older men, consider early referral to a primary care provider for bone density testing (10). Consider the addition of gastric ulcer prophylaxis (H2-blocker or proton pump inhibitor), if the patient is symptomatic, has a history of gastric ulcer disease, or is critically ill or hospitalized. In a large systemic review and meta-analysis, patients receiving corticosteroids in the ambulatory care setting have a very low absolute occurrence of and no statistically significant increase in absolute risk for GI bleeding or perforation when compared to placebo (14). NSAIDs and corticosteroids should NOT be used together, as concurrent use has been associated with the increased risk of gastric ulceration (13). b. CONTROLLED TAPER: Begin a slow taper (10). c. SLOW THE TAPER: Once the patient reaches a dose of 10 mg/day (physiologic doses are 5-7.5 mg/day), corticosteroid-induced side effects are less, and a slower taper can be pursued. Again, taper regimens can be individualized based on the patient's response. d. If at any point symptoms recur, increase the dose by 5-10 mg per day for a week until symptoms improve. Resume a slower taper. 3. REFER: Consider prompt referral to rheumatology for failure to respond to initial treatment, recurrence during taper, intolerance/contraindication to corticosteroids, or laboratory workup concerning for systemic auto-inflammatory disease. 4. CONSIDER ALTERNATIVES: Radiation therapy, periocular steroids, and pain clinic referral are additional options should the above options fail (15, 16). Gordon LK. Orbital inflammatory disease: a diagnostic and therapeutic challenge. Eye (Lond). 2006;20(10):1196-206. Montagnese F, Wenninger S, Schoser B. "Orbiting around" the orbital myositis: clinical features, differential diagnosis and therapy. J Neurol. 2015. Kazuo K, Fujikado T, Ohmi G, Hosohata J, Tano Y. Value of thyroid stimulating antibody in the diagnosis of thyroid associated ophthalmopathy of euthyroid patients. Br J Ophthalmol. 1997;81(12):1080-3. Dragan LR, Seiff SR, Lee DC. Longitudinal correlation of thyroid-stimulating immunoglobulin with clinical activity of disease in thyroid-associated orbitopathy. Ophthal Plast Reconstr Surg. 2006;22(1):13-9. Kubota T, Kano H. Assessment of inflammation in idiopathic orbital myositis with fat-suppressed T2-weighted magnetic resonance imaging. Am J Ophthalmol. 2007;143(4):718-20. Schoser BG. Ocular myositis: diagnostic assessment, differential diagnoses, and therapy of a rare muscle disease - five new cases and review. Clin Ophthalmol. 2007;1(1):37-42. Martins WA, Marrone LC, Saute R, Becker J, Vargas JA, da Costa Vargas JF, et al. Ocular myositis: insights into recurrence and semiological presentation. Int J Neurosci. 2015;125(9):711-5. Mannor GE, Rose GE, Moseley IF, Wright JE. Outcome of orbital myositis. Clinical features associated with recurrence. Ophthalmology. 1997;104(3):409-13; discussion, 14. Yan J, Wu P. Idiopathic orbital myositis. J Craniofac Surg. 2014;25(3):884-7. Jabs DA, Rosenbaum JT, Foster CS, Holland GN, Jaffe GJ, Louie JS, et al. Guidelines for the use of immunosuppressive drugs in patients with ocular inflammatory disorders: recommendations of an expert panel. Am J Ophthalmol. 2000;130(4):492-513. Kermani TA, Warrington KJ, Cuthbertson D, Carette S, Hoffman GS, Khalidi NA, et al. Disease Relapses among Patients with Giant Cell Arteritis: A Prospective, Longitudinal Cohort Study. J Rheumatol. 2015;42(7):1213-7. Weyand CM, Fulbright JW, Hunder GG, Evans JM, Goronzy JJ. Treatment of giant cell arteritis: interleukin-6 as a biologic marker of disease activity. Arthritis Rheum. 2000;43(5):1041-8. Takakura A, Kirkeby K, Earle K, Silkiss RZ. Predicting the Development of Orbitopathy in Graves Thyroidopathy Patients: The Potential Role of TSI Testing. Ophthal Plast Reconstr Surg. 2015;31(5):369-72. Costa RM, Dumitrascu OM, Gordon LK. Orbital myositis: diagnosis and management. Curr Allergy Asthma Rep. 2009;9(4):316-23. El Nasser AMA. Local steroid injection for management of different types of acute idiopathic orbital inflammation: an 8-year study. Ophthal Plast Reconstr Surg. 2013;29(4):286-9. Special Recognition: We would like to thank Chrisfouad R. Alabiad, MD, an Oculoplastics specilalist at Bascom Palmer Eye Institute who is board certified in both Internal Medicine and Ophthalmology, for sharing his preferred model for steroid taper once doses reach 10 mg daily or less.